Jeff McDonald : "Sturgeon Bay Light"
William Eklund : "Test 4 Echo"
Mary Ellsworth : "Hen and Chicks"
Karl Mohr : "American Homestead"
Everett Long : "Snowy Egret in Breeding Plumage"
James J Marsala : "Wheels of Change"
David Throgmartin : "Great Horned Owl"
Joseph Suchy : "Fire and Ice"
Sandy Ott : "Barn Ghost"
Robert Buell : "Winter Scene - Bark River"
Robert Buell : "The Forest Floor"
Signe Trewyn : "Morning's Work"
Cambell Alexander : "Resting Butterfly"
Linnea Tabaka : "On the Web"
Amateur (L-R): Sandy Ott, Robert Buell (not pictured Joseph Suchy, Signe Trewyn). Youth/Teen (L-R): Morgan Janovec, Cambell Alexander (not pictured Linnea Tabaka). Accomplished (Back Row L-R): Karl Mohr, David Throgmartin, Everett Long, Mary Ellsworth; (Front Row L-R): James Marsala, William Eklund. Best of Show, Jeff McDonald. 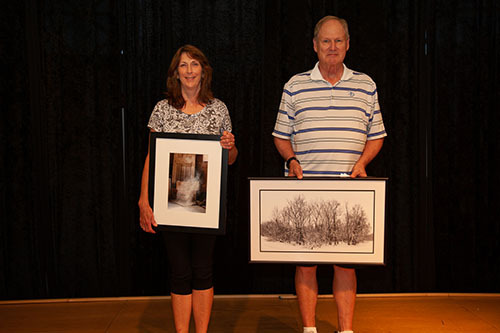 The Whitewater Arance honors Fran Achen's contribution to Whitewater by sponsoring the Annual Fran Achen Photography Competition and Show. Fran Achen was a longtime Whitewater resident, teacher, and local photographer. He is most remembered for his photographic collection which chronicles the history of Whitewater. Born in Kenosha in 1916, his interest in photography began after high school. He spent almost two years delivering cars for the Nash automobile factory. "It seemed like such fun to explore America, so that started my interest in photography and geography, which became my major in college," he said. In 1938, when Fran enrolled at Whitewater State Teachers College, it was the first year enrollment went over one thousand. Fran remembered being the last one to register, making the enrollment that year 1,008 students. While an undergraduate student at the college, he served as a photographer for both the Royal Purple and the former Minneiska yearbook, as well as working as a freelance photographer for the Janesville Gazette, making "a buck a picture" which helped to pay his way through school. While attending college, Fran met his wife, Lydia. They were married for 55 years and had three children - Chap, Randi, and Jim. After graduating from college Achen taught social studies for a year before being called up for military service in World War II. Achen served almost four years as the commanding officer of an entirely African American medical unit whose primary duty was to recover wounded soldiers from the front lines. Achen recalled years later that the Rhineland and Central Europe campaign was very successful and remembered crossing the Rhine River just two days after its capture. When the war was over he pursued his interest in photography by working in a studio in Madison, and later by purchasing a photography studio in downtown Whitewater, where he worked for 11 years. In 1956, after selling the studio, Achen continued to serve the community as a teacher at Whitewater High School where he taught his favorite subject, geography. He later became assistant audio-visual director for the Janesville school system. Achen retired in 1979. However, he never retired his camera. He continued to photograph the life and events in and around the Whitewater area. In the 1980s Achen donated nearly 400 custom printed and mounted photographs to the Irvin L. Young Memorial Library. The University of Wisconsin - Whitewater also has an extensive collection of Fran's photos. Although his photo taking slowed down in his later years, Achen said he was never afraid to flip the shutter on what he believed could be a lasting memory or a special photograph.